At the International New Age Trade Show (INATS), New Age Retailer Magazine selected Kailash’s Following Sound into Silence for “Best of Show” honors! 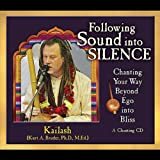 In this unique book/CD set, Kailash (Kurt A. Bruder, Ph.D., M.Ed.) urges readers to take up chanting as an authentic and effective spiritual practice. Although chanting is an ancient spiritual tool, it is well suited to our contemporary lifestyles. No generation before us has had to contend with the onslaught of voices clamoring for our attention, the chaos of distractions vying for our imaginations and allegiance, or the flood of information that is our daily lot.� Kailash shows how chanting, both alone and with others, can quiet and stabilize our minds, expand our hearts, elevate our emotions, and reduce our self-centeredness...yielding direct, sustained experience of the Divine. Accompanied by a companion CD featuring Kailash's extraordinary chanting, Following Sound into Silence demonstrates the potency of this practice in a presentation as profoundly moving as it is eminently practical. You'll understand why people across centuries and around the world have employed chanting as their principal resource for cultivating well being, personal transformation, and spiritual evolution. "Kailash combines his intellectual, artistic and musical expertise to create an outstanding guide to devotional chant in Following Sound into Silence: Chanting Your Way Beyond Ego into Bliss. First exposed to the powerful effects of chanting while conducting graduate research at a Christian monastery, Kailash further explored sacred singing while a college professor, by studying and taking part in kirtans, a practice originating in India. He is now dedicated to sharing his knowledge and experience through participatory concerts and workshops and through this inspiring book. Conveying the simplicity as well as the subtlety and vastness of the practice of singing the names of God, the book is suitable for beginners and also appropriate for those with more experience. "Following Sound into Silence is a penetrating insight into the depths of joy, peace and transformation that chanting practice brings to people's lives." "Following Sound into Silence will not only you assist you in connecting with the Divine - but will provide pure nourishment for the soul!" "If you are interested in the subject of mantra or chanting, I highly recommend Following Sound into Silence. It's full of fascinating information and powerful exercises. The CD that's included with the book is also very good." "In Following Sound into Silence, Kailash unfolds the heart of his journey through the world of devotion and chant. He lets us know how easy it is to let our voices guide us into the Sacred with sound." "What a wonderful resource for not only the titled subject--devotional chanting--but so many other things as well! Kailash has written a book rich with wisdom,� education, images, and even a CD to provide an actual experience for the reader. He writes in a grounded, accessible way on the nature of music and the instrument of the human body as a means to realize embodied spirituality in a way that integrates Eastern and Western spiritual traditions. Kailash has clearly written Following Sound into Silence from his love of the subject, as well as his desire to share the effects and inspiration of chanting and mantra. He takes the often esoteric subject of mystical spirituality and presents it in a way that makes living one's spirituality possible in everyday life. I consider Kailash's book a must-have resource on the often overlooked need of engaging our physical body in our embrace of our spirit and soul. Bravo! Kailash for a book with heart and wonderful for the care and embrace of one's soul! Kailash (Kurt A. Bruder, Ph.D., M.Ed.) believes that devotional chanting is a reliable tool that we can use to reduce our internal chatter, simplifying our mindstream from the usual (but overwhelming) chaos of thoughts, memories, feelings, and "to-do"s that plague our awareness and rob us of peace. More than this, because the content of our chanting is the very Sound Form of the Supreme, we provide our consciousness with something truly worthwhile to think, feel, and (ultimately) be. This CD features Kailash chanting 15 powerful mantras. Each is arranged and produced to retain the purity and intensity of feeling of traditional mantras, to provide support for listeners who want to chant along, and to make them as attractive as possible to a contemporary Western audience. You've never heard anything quite like this CD before. Its beauty is matched only by the transforming quality of devotion that it promotes in the listener.